Africa Safari Serengeti Central is a semi permanent camp in Serengeti National Park. This finest camp is owned and managed by indigenous Tanzanians, the management and office staff are local Tanzanians who have great knowledge of hospitality and have spent many years in travel and tourism industry, the team boast excellent experiences in both general customer care and hospitality services. Africa Safari Serengeti Central offers great value for semi permanent camping options on the northern safari circuit for travellers who enjoy being in great locations for wildlife viewing; Located at the Seronera area, inside Serengeti National park. It is truly an area of abundance in flora, fauna and cultural attributes. It epitomizes the best in diversity in all aspects as the species richness and natural history making the Camp an ideal eco-lodge from where you can partake to the world’s greatest wildlife spectacle. 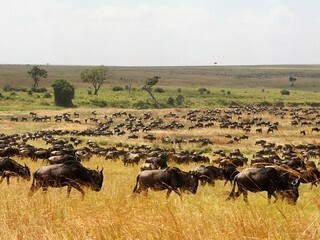 The Serengeti hosts the second largest terrestrial mammal migration in the world, which helps secure it as one of the Seven Natural Wonders of Africa, and as one of the ten natural travel wonders of the world. The Serengeti is also renowned for its large lion population and is one of the best places to observe prides in their natural environment. The region contains the Serengeti National Park in Tanzania and several game reserves. Approximately 70 large mammal and 500 bird species are found there. This high diversity is a function of diverse habitats, including riverine forests, swamps, kopjes, grasslands, and woodlands. Blue wildebeests, gazelles, zebras, and buffalos are some of the commonly found large mammals in the region. Don’t lose the oportunity to visit a natural hotspring… it’s really worthy and relaxing!